Why Parental Control is important? Raising kids in today’s digital era is not a piece of cake. While technology has made specific tasks more comfortable, it has definitely complicated the art of parenting. Who’d have thought? Well, technology has not been all that cruel, parental control apps have reduced the struggle of many parents. One, these apps are easy to obtain and two it comes with a variety of options to control your phone maniacs. After our parental control app review, we concluded that parental controls are the solution to the disease called “smartphone addiction,” that kids have developed over time. You may find several parental controls in the market offering simple to advance parental control capabilities; however, it is imperative to be a sharp judge of your kids’ requirement and invest your time and money (for premium features) in products which will incur real ROI. So, stop scratching your head and take a glance on the necessary features any parental control app should offer to secure kids. Which features are necessary for parental control apps? There is no definite answer to how many features are required, but what kind of features should be part of your parental control package can be readily determined. Blocking inappropriate applications is the most fundamental duty of a parental control app. Based on the type of content your kid watches, parents should be able to either restrict the category or the apps itself. As a stringent solution, many apps provide the capability to stop downloading apps from the Play store which is a way to nip the problem at the bud. It is easier to track which apps your kid downloads. Whenever kids’ want to download an app, they may request the parent to unblock the play store. Under parental supervision they can install the app and parent can switch off app installation once again. Another way of tackling your kids’ app content is initiating a parental control launcher that allows a limited number of apps. Parental control launcher is a child-friendly way of parental control, which on the one hand enable essential apps and on the other hand takes away the power to download or access any other apps in the cell phone. It is a win-win situation for both child and parent. Any decent app will offer screen time controlling as part of the parental control solution. Screen time controlling is an easy way to restrict screen time during important tasks like bedtime, study hours, dinner time, family time, etc. If your kids are addicted to social media or gaming apps, set a time for your kid to access these apps, beyond the fixed time frame your kid will automatically have to disconnect from their device. GPS driven features are the biggest highlight of any parental control app. Why? GPS ensures not only virtual but physical safety of the kid. Parental control apps are in-built with child GPS trackers to monitor kids’ location, define a geofence for being up-to-date with their neighborhood and keep an eye on their speed limit. Geofencing is a unique form of GPS tracking that provides instant notification when your kid enters or leaves a pre-defined vicinity. In case your kids are reckless drivers and you suspect them over speeding very often, then set speed limit for your kids and receive alerts whenever they cross the threshold. Your kids spend the majority of their time on the phone conversation, but the alarming fact is that they receive calls from unknown numbers, bullies and deceitful friends. The parental control app should provide a method to choose your kids to call buddies and callers. You should be able to block your kids incoming and outgoing calls. Any suspicious number you come across in your kid's contact list should need blocking right away. Check if the parental control app can perform these activities. In our parental control app review, we discovered very few apps that have considered Anti-Theft solutions for kid’s stolen or lost phones. Most kids have a habit of losing their possessions, consider this aspect when investing in a parental control app. How much ever you try to save your kids, they are bound to fall in trouble one way or another. But you can assure your kids “help” at the right time by providing them with an SOS button. If the parental control app has a quick SOS and Pick me (informing parent the current location of the kid) button for rescuing kids during an emergency, then continue using the app. Although, there are plenty of parental control apps in the market, finding an accurate and easy to comprehend parental control app is essential. As per our detailed review, all apps have comparable features with few apps offering unnecessarily advanced capabilities that barely come in use. It is advisable to utilize apps like Bit Guardian Parental control app for digital parenting. After the Bit Guardian parental control app review, we came to the conclusion that Bit Guardian’s smartphone monitoring and locking solutions are light years better than other players in the market. The GPS enabled functionalities are very popular and assure kid’s physical safety at all times. 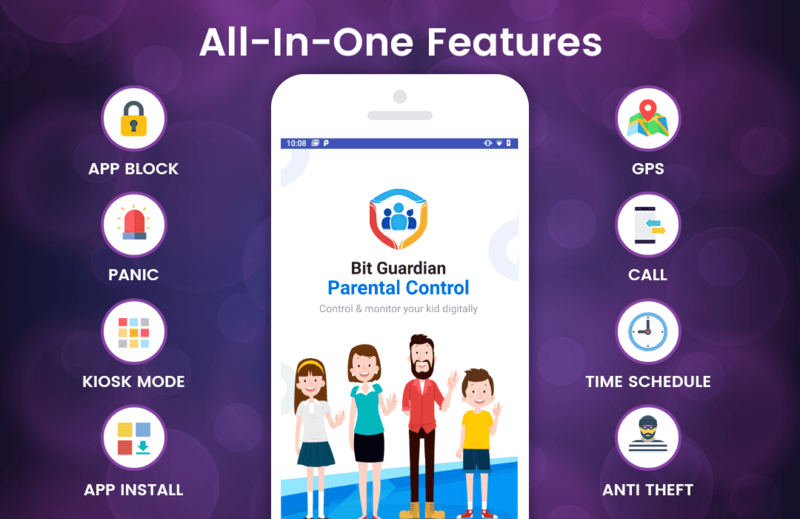 Accepting the fact that smartphone is the center of your kid’s life will save you time and energy, however, to ensure your kid’s future install the Bit Guardian parental control app and attain true peace of mind forever.